Security risks arise when older devices lack the most up-to date features and firmware updates to handle today’s security threats. 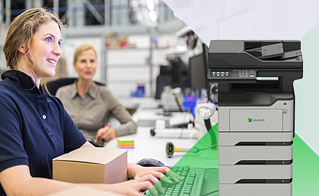 How often does your organization purchase new print devices? Traditionally, most enterprises look at print infrastructure acquisition in a three- to five-year cycle. This process initially involves researching devices that will last until the next refresh. The next step is engaging with vendors to gain more information. Then the potentially long and expensive RFP process begins. Think about the key players that need to be involved and how many hours it will take to complete the process. Projects will move forward eventually, but could take longer—and cost more—than expected. Going through the whole thing again in only a few years may not seem practical. That could be part of the reason many organizations keep devices past the originally planned five years. Our experience shows that in a typical enterprise fleet, 48% of devices are over five years old.